Back to the Blues brings together on stage for the first time, two exceptional musicians, noted for transforming Indian classical music: Aruna Sairam, acknowledged as the reigning queen of South Indian classical music, and leading composer and sarod virtuoso Soumik Datta. In this unique concert they will create a global soundscape, exploring South Indian music, North Indian music and contemporary jazz. Aruna’s extraordinary voice and the hypnotic sound of the 19-stringed sarod, Soumik’s signature instrument, backed by jazz piano with powerful Western and Indian percussion, will reverberate through the striking setting of St John’s Smith Square, an atmospheric former baroque church. Back to the Blues celebrates musical cultures which hold improvisation at their core. The two leading artists sparking off each other will be joined by three outstanding musicians: jazz pianist Al MacSween and versatile percussionists Pirashanna Thevarajah on Carnatic percussion (morsing, kanjira and mridangam) and Cormac Byrne on bodhrán (Irish frame drum) and percussion. Padma Shri Awardee Aruna Sairam is endowed with a powerful voice, colourful with extraordinary depth and resonance, she has been described as a “Queen of Soul”. Stemming from the Carnatic (South Indian) tradition, she takes Indian classical music to both the contemporary and global sphere, and works across genres including Sufi, jazz and Gregorian chant. Such inquisitiveness has led her to embark on incredible collaborations with the likes of Ustad Zakir Hussain (tabla maestro), Noureddine Tahiri (Arabo-Andalusian Sufi vocalist), U.Srinivas (mandolin virtuoso) and Jesse Bannister (saxophonist). Acclaimed British Indian composer and virtuoso player of the sarod, from the Hindustani (North Indian) classical tradition, Soumik Datta, bridges the world of Indian classical and contemporary music in daring performances. An avid collaborator and experimenter, he has worked with the likes of Nitin Sawhney, Anoushka Shankar, Woojae Park and both the London Philharmonic Orchestra and Cormac Byrne for his latest album, King of Ghosts. Back to the Blues is commissioned by the Bagri Foundation, a charity dedicated to promoting Asian arts and culture; and presented in association with Soumik Datta Arts, Soumik Datta’s charity, supporting collaborative musical projects. 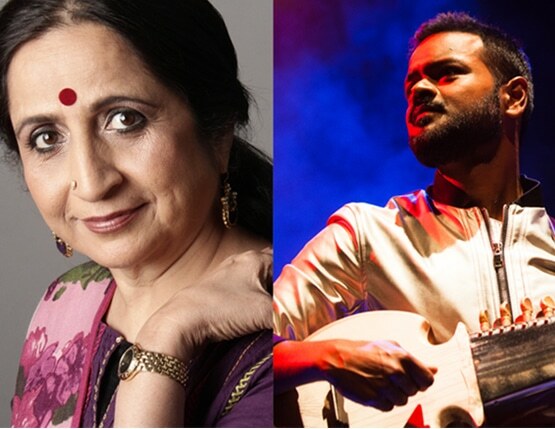 On hosting the concert, Dr Alka Bagri, Trustee of the Bagri Foundation has said: “the Bagri Foundation is thrilled to present with Soumik Datta Arts, Back to the Blues, an audacious concert bringing together the magnificent songstress Aruna Sairam and sarod virtuoso and composer Soumik Datta for the first time. Aruna and Soumik will explore the language of improvisation through the interweaving of Carnatic, Hindustani and jazz soundscapes. With this unique evening, we wanted to celebrate the diversity and vibrancy of music”. Aruna Sairam’s vocal style is rooted in the Carnatic tradition, yet continues to evolve into the contemporary, through collaborating with leading musicians such as Ustad Zakir Hussain, Christian Bollmann, U.Srinivas, Jesse Bannister and Shankar Mahadevan. She has performed all-over the world from the Royal Albert Hall, Carnegie Hall, Le Theatre de la Ville and the Fes Festival of World Sacred Music, Morocco. Soumik Datta is a leading British Indian composer and virtuoso player of the sarod (19-stringed fretless instrument). He has collaborated with acclaimed artists such as Nitin Sawhney, Anoushka Shankar, Joss Stone, Akram Khan, Beyoncé, Jay-Z, Talvin Singh, Manu Delago, Shankar Mahadevan, Woojae Park, London Philharmonic Orchestra and Cormac Byrne. He has performed internationally at many prestigious venues including Southbank Centre and Shakespeare’s Globe and is in collaboration with the Royal Opera House. Pirashanna Thevarajah is an extremely versatile percussionist, playing instruments including mridangam, kanjira, ghatam and morsing and is well versed in konnakol. He has performed with renowned artists from Pandit Ravi Shankar, Anoushka Shankar, Aruna Sairam and Nitin Sawhney. Cormac Byrne is a bodhrán player and percussionist in high demand across many genres such as traditional Irish and Folk, classical, jazz and pop. He has worked Kefaya, Giuliano Modarelli, Scottish Chamber Orchestra, Damien O’Kane and with Soumik Datta. Al MacSween is a pianist from a jazz background, exploring genres from Afro-Cuban music, Indian classical music, Arabic music to electronica. He has worked with artists including Ruby Turner, Abram Wilson and Pee Wee Ellis and regularly performs with Reem Kelani and Olcay Bayir. MacSween is co-founder of Kefaya, an international music collective. The Bagri Foundation is a London based charity, working in the fields of education, relief work and culture. Through a multidisciplinary events programme, the Foundation aims to foster understanding of Asian cultures, artistic exchanges and enriching experiences. The Foundation believes in the power of collaboration and works with leading organisations, scholars and artists to encourage critical thinking, disseminate knowledge and offer platforms for creativity to blossom. The Bagri Foundation is particularly proud to support musical collaboration to establish bridges between cultures, for instance projects such as Tuning 2 You, a documentary series with Soumik Datta Arts, celebrating modern India’s rich folk music heritage and Ravi Shankar’s only opera Sukanya, a co-production between the Royal Opera, London Philharmonic Orchestra and Curve. Soumik Datta Arts is a London based charity sarod player and composer Soumik Datta set up in 2013 to support new, collaborative musical projects and to assist young talent.